Supporters of accused Nevada extortionist Cliven Bundy are planning to protest outside a federal courthouse in Las Vegas Thursday where he faces felony charges for his 2014 armed standoff with federal agents. A post on the Bundy Ranch Facebook page is asking supporters to fill the sidewalks outside the federal building from 10 a.m. as well as the public area of the courtroom for his 2 p.m. arraignment. Bundy faces 16 felony counts including extortion, conspiracy to commit an offense against the United States, and threatening a federal law enforcement officer. Bundy, 69, is among 19 people, including four of his sons, who were indicted last week in connection with the Bunkerville showdown in 2014. 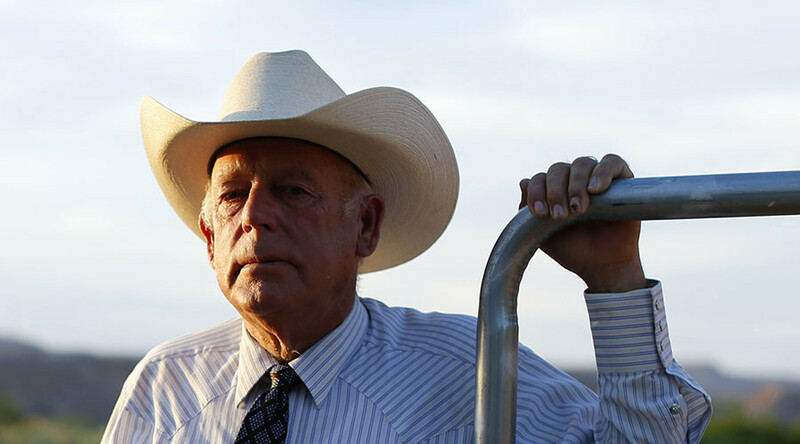 The confrontation began when the Bundys and 270 supporters, funded in part by the Koch Brothers and their campaign to privatize public land, took aim at federal agents who were trying to collect 20 years of unpaid grazing fees for allowing his cattle to feast on publicly-owned land. The Bundy gang outnumbered National Park Service rangers four to one and some trained a sniper squad to threaten federal employees. Bundy was arrested in February in Portland, Oregon on his way to the Malheur National Wildlife Refuge where his sons Ammon and Ryan were involved in a 40-day armed occupation of a federal building in defense of two alleged terrorists. Taxpayers already had to pay for the increased security costs for Bundy’s brief court appearance last Friday, where he told US Magistrate Judge Bill Hoffman that he did not have a chance to read the 63-page indictment against him and was not prepared to enter a plea. Bundy also said he needed time to find a lawyer to represent him. Small rallies were held earlier this week by Bundy supporters over the death of LaVoy Finicum who was shot and killed by Oregon State Police while resisting arrest during the standoff last month. Despite threatening to carry guns at the rally, none were visible.